Look 1: Motel dress. Privileged shoes. Look 2: Minimale Animale bikini. Look 3: UNIF skirt (similar here). Jeffrey Campbell shoes. Look 4: Shelfies jumper. Windsor Smith shoes. All accessories from Moonspell Rising and Modern Trend. These photos are from my shoot for Disfunkshion Magazine, and the issue was just released! Find it at Barnes & Noble and other bookstores, or check their site here for other outlets. This is my favorite shoot thus far, and being able to style it perfectly on my own (with almost everything from my own closet) made me really proud of myself! Being turned into a mermaid is always a great thing. What a beautiful mermaid! Awesome pics! You look amazing! The dress in look 1 is stunning! one of my favorite shoots of you, absolutely flawless! Stunning photos! Your blog is lovely! 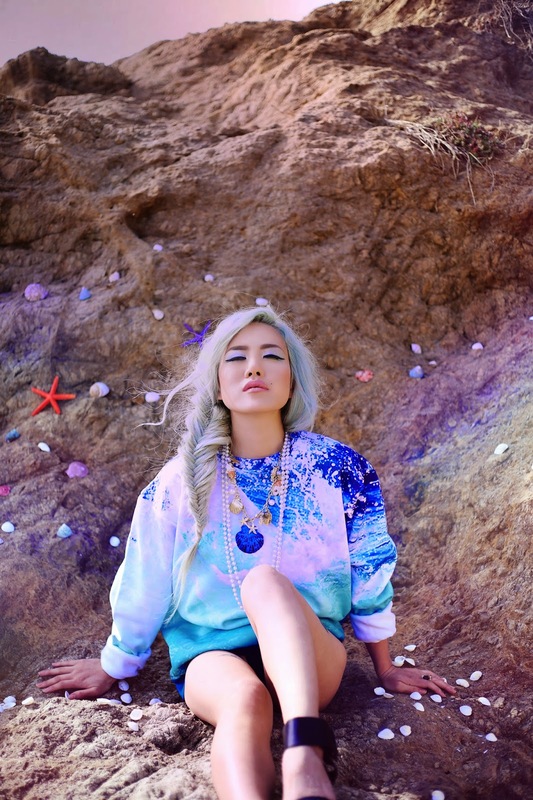 Love all of these looks…you look like a beautiful psychedelic water goddess..! Love all these looks! Very mermaid but not over done.